Our Teddy Bear's Journey – Theodore was born with renal failure. This is his story. Theodore was born with renal failure. This is his story. Last year, I talked to so many special needs parents who were experiencing frustrating, disappointing holiday seasons. I’m willing to bet that their children weren’t any happier. Your holiday isn’t going to fit your mental ideals. 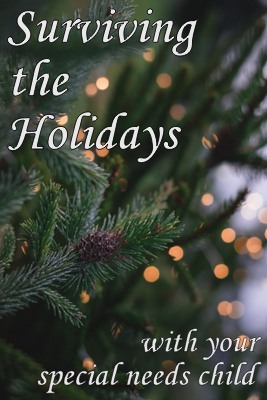 Yes, you may dream of re-creating the Christmases of your childhood – or of creating the Christmas you wish you had as a child – but, especially if your child isn’t a typical child, that might not be very realistic. Create a holiday celebration for the child you DO have, not for the typical child you WISH you had. Perhaps having wrapped presents under the tree in the days leading up to Christmas is your ideal, but you have a child with ADHD and major impulsiveness issues. If not “ruining the surprise” is important to you, keep those presents well hidden until the children are asleep on Christmas Eve. Or perhaps your child with anxiety just really falls apart over the idea of having surprises. My youngest doesn’t prefer to be surprised by presents, especially when he knows far in advance that there will be gifts. For his birthday this last year, I just ended up telling him what some of his presents were – he was surprisingly fine with waiting to see them on his birthday, and knowing what was waiting for him helped him be excited instead of anxious. How can you change your expectations, or what new traditions can you create, that truly help your special needs child enjoy him or herself? Raise your hand if your special needs child LOVES holiday get-togethers and exhibits perfect behavior? Have your hand up? Skip this section. And yay. Truly. Or, how can you make those gatherings better? Can you limit the time you spend? Is it better for your child if you go somewhere, so you can leave as needed, or is it better for you to host so that your child can be in familiar surroundings? And, of course, the perennial “my family knows my child is immune suppressed but showed up obviously sick anyway.” Don’t be afraid to leave. You aren’t obligated to stay at a gathering where the other attendants can’t respect your needs, assuming you’ve made them clear. Good communication in advance is usually helpful here. What if Family Doesn’t Care? But let’s say your family is like many, and they don’t care. (Or don’t seem to care.) The good news is, you don’t have to get your family on board to still take care of your child. Pack a bag of coping skills – physical and mental. Bring whatever helps your kid. Playdough. Weighted lap pad or blanket. Headphones. Electronic Device. Books. Toys. And when you notice your kid is ready for a break, or starting to lose it, just whisk him or her off to your pre-scouted quiet area for a little one on one time until he or she is ready to rejoin the group. No explanations necessary. You don’t need anyone else’s buy-in to take care of your kids. “But!” you say. “BUT!! The mean looks, the rude comments!” Whose children are these? Not Aunt Susie’s. Yours. Mean looks, you can ignore. Rude comments, you can ignore or address. You’re going to have to play that one by ear. I don’t engage. I ignore, I purposefully misunderstand, I deflect with humor, I change the subject, or I leave the area. Experience has shown me that engaging isn’t worth the effort. But some people have great luck engaging in polite, educational conversation. If you think your relative/relatives might actually be interested, chat away! This can be tricky. Bear in mind that nobody HAS to buy you or your kid a present. Ever. In advance, if your child has particular needs, you can lay the groundwork for good gift ideas. “Hey, you might have noticed that Sam struggles with gross motor skills. I know you bought a bike for the other kids at this age, but Sam is still probably a few years away from being able to pedal successfully – he would, however, really have a lot of fun with .” One year, I just let family know that Teddy was developmentally still several years behind peers, and in particular with fine motor skills, so he wouldn’t be able to use things like puzzles that require fine motor skills, and if they had any questions about the appropriateness of a gift, just to ask and I’d be happy to help. But what if your kids get gifts that just don’t work? They can’t eat much orally, and they were given candy. They can’t hold a pencil and they were given coloring books. In general, the only appropriate response to a gift is “thank you.” Even if, even if, even if. You may disagree, that’s fine. But in my opinion, being rude doesn’t solve anything. Say thank you and move on. What if the gift giver asked for ideas and then got something else? Say thank you and move on. What if the gift giver knows that the recipient literally cannot use whatever the gift is? This appears trickier than I think it really is. Think about the gift giver. Are they clueless, do they have difficulties themselves, or are they just mean? Clueless and difficulties can be forgiven – it really is the thought that counts, even with our special kids. Meanness – well, that’s really up to the individual to decide how to handle, and how you handle it will depend on your long term goals for that relationship. You might not realize it, but it’s likely that your friends who are parents of medically intense and/or special needs kids are lonely. This life is a lonely one. Most of us feel as though our friends who parent only more or less typical kids just don’t understand our lives. 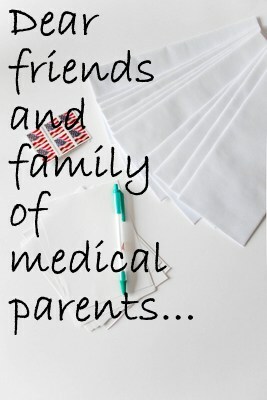 We often face misunderstanding or denial of our children’s diagnoses by family, we receive criticism of the way we parent by basically everybody who’s never parented a kid like ours, and we spend inordinate amounts of energy on calling doctors, therapists, insurance, and pharmacies. And yet we sometimes act in a way that makes you think we don’t want your company. You might sense that we find some conversations awkward, for example. Or we might consistently decline invitations. Or accept invitations and then cancel. Sometimes at the last minute. I totally get it that, eventually, you might decide to just stop inviting us. After all, we almost never show up. And you know we’re busy. And you know we’re tired. And it feels like you’re helping. Like you’re doing us a favor. Saving us from having to decline yet another invitation. But, to us, it feels like we’re being excluded. Yes, we may almost never show up to things that you invite us to, but we still like being included. For one, we like being treated like adults who are capable of deciding for ourselves what we can or can’t make work in our lives. We know you don’t mean it like this, but when you decide for us whether we can or can’t come to something, it feels… discriminatory? infantalizing? insulting? like a thinly veiled way to tell us you just didn’t want us there? But also, we just plain like knowing we haven’t been forgotten, that our friends or family still want us around. That we still have the option of hanging out with regular people if our crazy lives allow the opportunity. We already feel pretty lonely, but seeing pictures of all of our friends except us going to a movie together just really drives that home. Seeing that your family had a big thing and you didn’t even know about it just plain hurts. In this age of social media, the previous polite understanding of “don’t talk about an event in front of people who weren’t invited” doesn’t seem to apply any more. Inevitably, selfies are taken and shared, and our lives feel just a little bit more lonely, more isolated. I’m bringing this up today because, yes, we had a situation or two like this in the recent past in our own family, but also because I see this come up time and time again in special needs groups. I’m almost certain that, for the most part, the hurt is very unintentional. But it’s still real. You can do this, too, if you feel you need to. Or you can just keep inviting your friends/family who are parents of Medical/Special needs kids to things. Maybe some day, they’ll actually show up, but in the meantime, chances are good that you made their day a little brighter just by including them – just by letting them know you haven’t forgotten them. Do me a favor. Either really believe in caregiver self-care, or just stop talking about it. Oftentimes, the end result of these types of comments is the parent/caregiver just feels even crappier, because they KNOW they should be taking better care of themselves, and you’ve just reminded them that YOU KNOW they’re failing at this. And parents don’t like to think their child’s doctors see them as a failure at anything. So either help, or just shut up. How can you actually help? Well, for starters, if you know you don’t plan to actually offer practical help, then don’t bring it up. Do you plan to find me a trustworthy babysitter or respite person who is comfortable with Gtube feeds and medications and severe ADHD and developmental delays? And the money to pay for both them as well as the evening out? No? Then why bring it up? When you bring it up, it makes me feel like I have to justify myself to you. “Oh, well, it isn’t really that easy…” and then it turns into a conversation of me trying to convince you that it’s actually not that easy. But the thing is, this is really actually NONE of your business. I actually shouldn’t HAVE TO try to talk you into understanding that the real life, on the ground experiences of your patients are different from your own personal experiences. Secondly, if you really have a commitment to caregiver self-care, take a minute to assess all the things you’re asking your patients’ caregivers to do. And then think through the things that all the child’s other doctors are asking them to do. And then look at that list. Really look at it. And then consider if, in exchange for a bit of sanity, or some time to eat lunch every day, you could let something go. Nothing you can let go? How can you get community supports in place to help? Thirdly, listen to the parents of your patients. If they’ve made a well thought out decision to drop something from their radar, LISTEN TO THEM. Why did they decide to let that thing go? Are they overlooking important information that they need to know to make a better decision? Are there compromises to be reached here? Is there something ELSE you could back down on so the parent feels able to bring increased focus to the area they had previously dropped? If the thing the parent has dropped feels vitally important to you, the doctor, then it’s time for a conversation, but the conversation needs to be more than just “this is important, so do it.” You need to look at the child and parents as whole people. 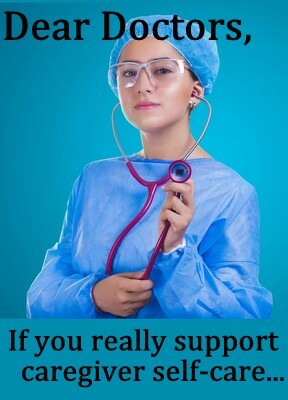 Your patients’ parents are more than just unskilled labor existing solely to support your patient. This update isn’t going to be as clear as most of them. Because Immunology is super hard, turns out, and I don’t fully understand all of it. So we saw immunology at the request of Transplant. We’ve seen Immunology in the past – when he was having all those blood infections from his central lines, and then right before and right after transplant – and they said he had some immune deficiencies but some IVIG should take care of it, get him through the post-transplant period, and he should be fine. And he was, for the most part. In fact, he had low IgG at that time, and now he doesn’t. But then the CMV kept coming back. All the respiratory infections. Bunch of other infections. All mild, nothing super big, but just constant. Which I had assumed was just… normal. But when you make a list of all the infections, it’s a really big list. Big enough that Transplant was shocked when we really listed them all out. And then include the mystery fevers and the UTIs that aren’t UTIs… it’s a big list. They ran some labs. And I don’t understand most of them. I mean, they’re all numbers and random letters. And Google is absolutely no help. I can Google the individual things, for the most part, but putting them together to make some sort of picture that makes sense…. nope. Can’t do that. NK Cells are the cells that are supposed to respond quickly to viral infections and cancerous cells. Teddy’s just can’t be bothered. I’ve been looking for a link to put here of what happens when your NK cells don’t work, but I could find basically nothing. Because basically nobody really knows much. Whoohoo. In fact, most articles start by acknowledging that, essentially, we don’t know much about NK cells but we know they’re important based on looking at people whose NK cells are either too few or too lazy. There’s this, but it’s just a lot of long words to say, “well, who the heck knows, anyway…” and then a bunch of majorly depressing shorter words about all the things that destroy the people who have this. He also has impaired T-cell function. That is from the immune suppression, probably. The “probably” part makes me giggle a little. Like I said, immunology is hard. (A study published in 2015 says, “But the immunoregulatory mechanism of FK506 is still largely unknown.” (FK506 = Tacrolimus, one of the two immune suppressants T takes.) So we’re doing this to him on purpose. Probably. Then he has antibody deficiency. To determine this, they look at whether he responds to and maintains a response to the immunizations he’s gotten. He hasn’t. We’d previously determined that the MMR was essentially a waste of time (man, remember all the bellyaching I did over that one? Those two, really? So close together like that to squeeze them in before transplant? Shoulda skipped it.). I can’t remember which other ones we’ve checked, either around transplant time or more recently, but every one we’ve checked has come back as not immune. Not immune despite, in some cases, extra doses. More reading here. And then there’s the rest of the effects of immune suppression. So I don’t think this is the end of the story for T immunologically. I don’t know if having two or three things wrong with his immune system means there’s one over-arching immunologic diagnosis… it’s certainly not specified in the clinic notes and is one of my questions for our next immunology appointment. It’s also possible (I want to say likely, but we’re not going there) that the results from Genetics will shed some light on this. Teddy started SCIG and will continue it until the end of time. Subcutaneous Immunoglobulin. It’s an infusion of immunoglobulins that goes in under your skin. Once a week, Teddy’s going to get an infusion that will last for an hour or so. The medicine goes under his skin in a big lump and then is slowly absorbed over the next 24 hours or so. We did the first one last week at UI and it was fine. We’ll either go back again this week or we’ll start doing them at home this week. We’re still waiting to hear one way or the other. (Because, you know, we don’t have anything ELSE on our schedule, right?) This is what he’s getting. We’ll do this every week for all time. And it’s fine. I hate it. I hate it a lot. I super hate it. I hate it. We may not see any improvement in infections for SIX MONTHS!! I hate that, too. We have to do this every week. EVERY WEEK. But it’s fine. I mean, I’ve given him injections. Daily and weekly injections. This is better than that. Right? It’s better than dialysis. Dialysis was nightly. And it was awful. This should be OK. But it’s just one more thing, you know? One more thing. One more thing for us to have to do at home. One more hour and a half of his life every week that we have to devote to medical things. 78 hours a year. One more thing I have to do to him. One more thing I have to force on him. One more time I get to be his nurse AND his mom all at the same time. One more thing. I don’t want to be misunderstood here. I’m happy to do it. I would do anything he needed. Gladly. But I’m so tired of one more thing. I’m considering making a series of Dear Doctors posts. Dear Doctors, Here’s Some Things You Might Not Realize From A Patient Perspective. Why is everything so very very hard? I truly don’t understand it. When I call and say, “Our insurance won’t reimburse very well for the prescription at this particular concentration, but if you change the concentration to this other option, they’ll reimburse it fine. Can you please write a new prescription for this other concentration?” this should be a simple transaction. Nurse gets message, relays need to doctor. Doctor says, “sure, that seems simple enough.” Doctor writes new rx, nurse returns call and says, “ok, it’s ready to pick up any time today before 4,” and then there actually is someone available at the clinic until 4 to enable pickup. That is SO EASY. It’s not hard. It isn’t. Until YOU make it hard. Until your nurse calls and argues that there’s no reason not to fill it as written. Until your nurse calls and doesn’t care about reimbursement rates. Until your nurse calls the pharmacy and countermands my instructions to the pharmacy. Until your nurse refuses to ask you to please just do this because it’ll take 5 minutes. Until it takes three more phone calls. Until there isn’t anyone at the clinic to hand me the prescription when I show up during the time I was told because they’re all at lunch. And that doesn’t seem like a big deal, right? So it was a few phone calls and an inconvenience in having to wait around at the clinic. NBD, right? Except those were only a handful of healthcare-related phone calls I had to make that day. Except that day wasn’t the day I had respite, and just leaving my house to pick up a prescription is a lot harder than it is for you with your regular kids. Except I had only slept about 3 hours the night before, and the night before that, and the night before that going back 6 years. Except while I was on the phone, my child – your patient – was opening the front door again and running down the sidewalk because I wasn’t paying attention. Except I had to use the time I was hoping to actually eat some lunch to drive over and pick up the prescription. I skipped lunch that day, again. Except I had just spent the last hour managing medications and getting food started for my kiddo, and had been looking forward to actually getting something accomplished when I got the call from the pharmacy explaining that your nurse had told them she wouldn’t ask you to change the prescription. Except, except, except. Except our life is HARD. Life is so hard, every day. We are still really just surviving. And have been for six years. And I don’t have the kind of stamina I used to. And when YOUR office makes things so much harder than they need to be… it’s just HARD. I need a new word. It didn’t need to be so hard. You let it be hard. You made it hard. You could have made it easy, but you CHOSE hard. I don’t know why you would treat patients – your customers – like that. I would challenge care providers – especially those who care for children with a lot going on – to ask their patients if their office is doing anything that makes life harder than it needs to. Some of those things won’t be able to be changed. Our pediatrician’s office lets you come in for vaccine only visits only at a certain time every day – a time that’s horribly inconvenient and hard for us. But that’s what works best for their work flow and I totally get that. But some of the things you can change. LISTEN to your patients. Consider their feedback. I’m not talking about the post-visit satisfaction surveys. I’m talking about calling parents a few days before their visit and telling them you want to discuss this, or emailing them a few days after their visit. Honestly seek their feedback. Make sure they feel safe to tell you. And LISTEN. Ask if they have suggestions for improvement. Talk about their ideas to your staff. See where you can make improvements for your families – tiny things can make such a huge difference in the lives of medical families. If you’re familiar with the musical Carousel, and the song June is Bustin’ Out All Over, sing that to the tune. June is super full of doctors! Not really June, though. More like the last half of June. That’s really all we’re doing last week and this week and part of next week. Just doctors. Labs look good, except the things that look bad. The things that look bad are from known, transient causes, and will hopefully straighten out on their own. We met with nutrition, who I liked way more than last time. She has more families with blended diets now, she’s a bit older now (I mean, it’s been a few years), she wasn’t as full of fresh-out-of-college advice. She gave us the GREAT news that because the bulk of T’s diet is gtube and very healthy, he can have as much oral salt as he wants. Which is awesome because 3 months ago, his nephrologist asked us to cut oral salt. And Teddy’s oral foods are basically all salt based. We switched to low salt chips and he stopped eating them. Whoohoo! He got a renal ultrasound the day before, for his urology appointment later this week, and nephrology peeked at it and confirmed how very very pretty his pretty pretty kidney is. Then his urine came back all icky. So we’re going to do a 24 hour catch to screen for kidney stones and also we dropped more urine off this morning to double check for UTI. We had HOURS between appointments and the plan had been to burn off some energy at the playground, but it was POURING rain, so we ate ice cream for lunch and played go fish before going to the waiting room for neuropsych about an hour early and playing with their toys and puzzles. The doctor came out about a half hour early and said she was back from lunch and ready to go if we were, so whoohoo. That appointment both went well and was harder than anticipated. It wasn’t the “OK, NOW I know what’s going on with him!” that I had expected. Last year, the story was that he was too inattentive to really be doing his best for their tests, but if we had him on meds that worked for this year, it should be pretty revealing. And it was sort of, but not so much in other ways. I’m dancing around this a little, but it was both revealing and still not revealing enough. But evidently this was the visit where we finally wrote down a new diagnosis, but with the understanding that further diagnoses are definitely still pending. I don’t know. I’ll write more about this later maybe. I’m still mulling. So last week was Case Manager, Ultrasound, Iowa City, BHIS a few other things. This week is BHIS, therapy, dentist, some sort of screening appointment for a potential new psychiatrist, urology, Dr. Noble (ugh), a few other things. Next week, we cap off our insanity with another full (3 appointment) day in Iowa City, where we meet with the people who decide our fate. Not really. But it feels like a heavy, destiny-influencing day. Genetics. Immunology. Aerodigestive. Croup. Teddy continues to get croup monthly. His regular Otolaryngologist decided that he’s above her pay grade at this point, so had us see aerodigestive at UI. (and we want to see aerodigestive at Cincinatti – and I think we’re still headed that direction – but I don’t regret going ahead and seeing them at UI.) That doctor did an in-office scope on Teddy and discovered a few things. a) his left nostril dead ends. That seems like a big thing to miss for 6 years, eh? That’s going to be a new thing to tackle but not just at the moment. b) his airway is just awful looking. Very angry tissue. c) he didn’t see any stenosis. He thinks his airway looks like severe reflux. Even though reflux was ruled out by a pH probe. Even though he’s been on reflux meds before with no noticeable difference. Even though, even though, even though. And this isn’t the first time we’ve heard it, and it was even a theory I had. Even after the pH probe (because they aren’t 100%). So I’m on board with this as a working theory. We’re trying a PPI again and we’ll see. He said to do it for 2 months and if he hasn’t had croup in that time, we can figure it’s working, but I’m assuming that we’re also going to do another scope. In the meantime, after 10 days on the PPI, he got croup and ended up back in the hospital, so…. Transplant is concerned that he’s getting sick that often – and then I told them that this doesn’t even include when he’s sick and doesn’t get croup. I don’t even keep track of that. We’ve been working with a new therapist for about 8 months now and she said this week that she has not seen him NOT sick – and she comes weekly or every other week. He’s sick ALL THE TIME. People want to know why we never go places and do things, it’s because Teddy’s ALWAYS SICK. They’re concerned, so they had us see immunology. Immunology basically wanted to run a bunch of labs, but based on the labs they’d run the last time they saw him (pre transplant when he kept getting line infections), they had an idea of what they’d see and had worked out a treatment plan that we’d proceed with when the labs came back looking as expected. The labs have come back. They’re not as expected. I don’t have the first idea what they mean, because immunology labs are HARD, man. But some things are WAAAAY of kilter. Genetics. Meanwhile, I requested to see genetics again. Last time we saw them, he had far fewer diagnoses and they were really just looking at liver things, or liver/kidney things, mostly to rule out big things that could affect transplant. They never did any general overview stuff. He has SO MANY diagnoses right now, it’s hard not to wonder if something doesn’t tie a lot of things together. I have a few theories from Dr Google, and I think they’re good theories. We’ll see what they say. Microarray came back normal. Weight/eating. He recently started a new med that has, as a side effect, appetite suppression. He has stopped eating by mouth almost entirely, and he’s lost a not insignificant amount of weight. We’re trying to stop that weight trend by increasing tube feeds, but I think we have to increase them more than I realize, or else something else is going on. CMV He continues to have elevated CMV levels. He’s been on a treatment dose of Valcyte for a month now and the level’s finally gone down. He’ll be on treatment dose for another month, then down to a prophylactic dose for a while. Again. Me = not a Valcyte fan. There’s just something else. Something. He’s struggling. And I don’t know what it is, what we’re missing, how we’re missing it. I’m hoping Genetics, neuropsych, immunology, and Aerodigestive can suss this out. If it doesn’t happen on its own, and if nobody has any major breakthroughs on their own, I’m going to ask if everyone – neuropsych, transplant, genetics, aerodigestive/ent, immunology, and either letters from or conference calls with OT and possibly his BHIS worker – can get in a room together and share ideas. We have so many pieces. So many. How do they fit together?